Musicbox allows you to listen to live radio stations on the go. Radio stations are added frequently and downloaded automatically to the playlist, when you connect to the internet. Please ensure you have an unlimited data limit to avoid unexpected data costs. 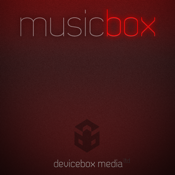 Please send any suggestions, comments or feature requirements to support@deviceboxmedia.com.